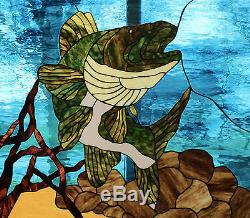 Custom Handmade in the USA Stained Glass Designs. We are professional artists that handcraft our panels in the USA and in our studio. Many of our panels are ORIGINALS we design in our studio. We select our glass by hand, directly from the manufactures to ensure good quality and a consistent grade. The soldering is of professional quality. We take care to make sure your window is re-enforced properly to ensure a window that will last 100's of years with proper care. 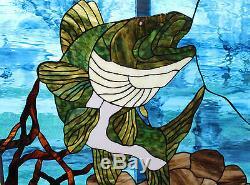 Our stained glass art pieces are of the highest quality and are clearly elegant. The craftsmanship is absolutely exceptional. We take pride in our artwork. As they say A picture speaks a 1000 words! Original by Stained Glass Heirlooms. About the Art Piece Photos rarely capture the true brilliance of the colors and textures of art glass. At Stained Glass Heirlooms we strive to get great photos, but we also hope you realize the art work will intensify and pop when viewing in person. Specifications of window This window is full of upper end art glass! Approximate size: 30 1/4" x 26 1/2". Bevels Grade: 1 - top of the line - NO seconds. Glass Grade: 1 - top of the line - NO seconds. Zinc framing that was custom made in our studio. Black patina with protective coating applied. Window can be hung as shown. 2 foot of chain and "s" hooks included. If the window can be hung multi-directional we drill all corners so you can change the look from time to time. The drilling can't be seen if used in a fixed window type of display. It is the best method for hanging since we don't have to remove the hangers for you. Removing hangers will leave a messy looking zinc came frame. Nothing worse then purchasing something that has to be modified only to look horrible once done. PLEASE SEE OUR ABOUT "ABOUT ME" PAGE FOR SERVICES WE OFFER. Stained Glass Heirlooms 200 Sycamore St Tipton, IA 52772. Each window or panel is handcrafted and crated once ordered and paid for. The glass is handmade and may vary in color, density etc. We will make every effort to reproduce the same panel, but variations may occur that are beyond our control. Tracking numbers are sent the day of mailing. If less than the amount we would have chosen then nothing is due in return. Absolutely NO seconds quality glass. Hand selected glass from the manufacturers. If your window has bevels they are top of the line bevels NO seconds. If your window has jewels they are usually antiques or are German made which means quality. All art work is produced in the USA and is handmade. Rich black patina is applied to all leading and is unified in color. Oxidation retarder is applied to all leading. This procedure is waved when the client is going to insulate the window since no air will be allowed to get to the window once the process is done. Thick protective coating to provide clarity is applied to patina to help prevent oxidation and make the leading shine. Instructions on how to care for your window. This is worth every dime you spend with us. We tell you how to manage your window over the years to keep it looking as good as the day it arrives. Instructions on how to remove your window from the crate. Custom wooden crate fully lined. Though you may not see the damage right away over time you will. We don't take chances since we stand behind our work. Customer Service that doesn't stop once you receive your window. If you have questions on how to install the window, hang the window etc. Please ask we will help you as best we can. 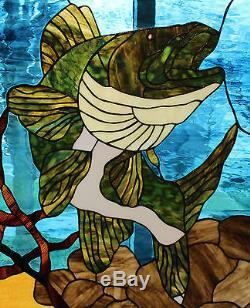 The item "Walleye Stained Glass Window Panel EBSQ Artist" is in sale since Friday, March 15, 2013. This item is in the category "Antiques\Architectural & Garden\Stained Glass Windows". The seller is "crystallclear1047" and is located in Tipton, Iowa. Approximate Size: 30 1/4" x 26 1/2"